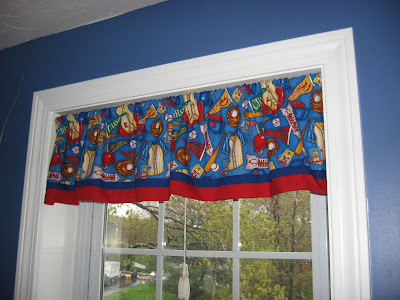 Have you ever wanted to dress up a window with just a simple valance but couldn't find just what you were looking for? Did you ever think of sewing one yourself? If you think you can't do it, take a look at this very easy tutorial and I think you might be surprised at just how easy it is. 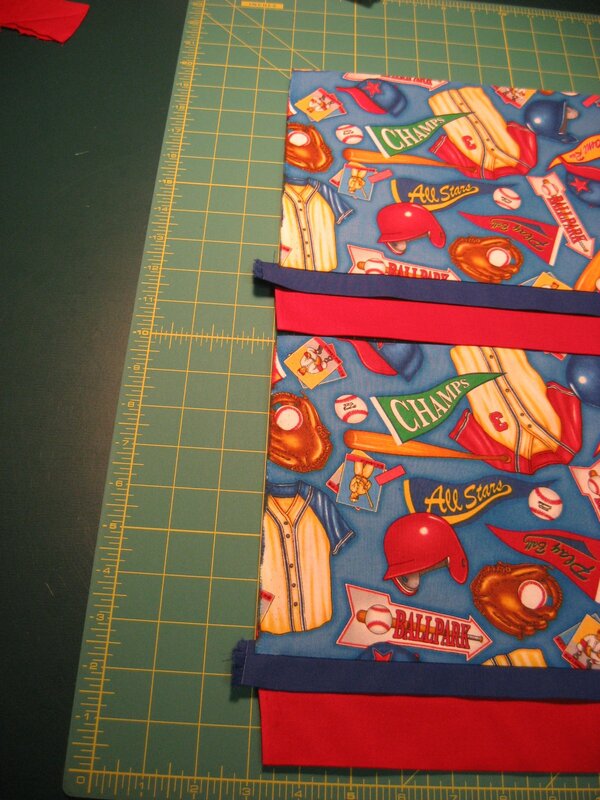 This one requires some fabric, only three straight stitching lines and a couple trips to the ironing board. 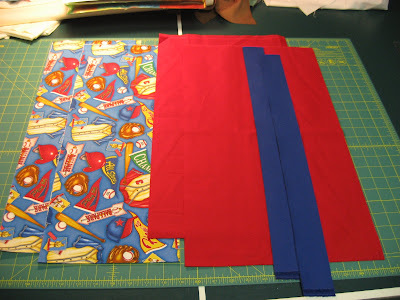 For this project, I am actually making two valances exactly the same, one for each window in my son's bedroom. His bedroom walls are painted a deep blue on top and a bright white under a white chair rail. 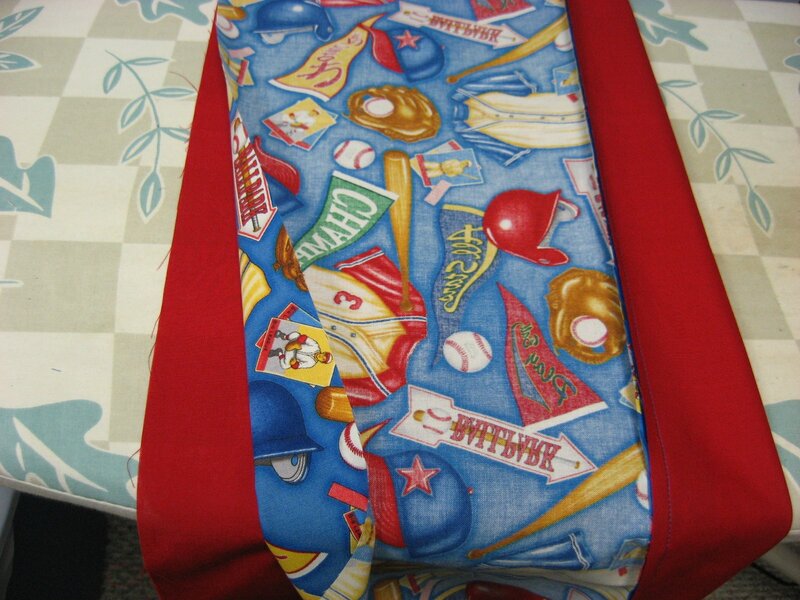 I picked out some very boy looking sports fabric for the print and I'm pairing it with a solid red for the large band at the bottom and the lining and a solid blue for the small accent band layered between the print and the red. The measurements I am working with are 28 inches for the opening of my window where the valance will hang, and 10 inches long for the length of the valance. You can make adjustments if you have a bigger opening or if you want a longer valance. I didn't want these valances to be too gathered, so I will be using just the width of the fabric for the width of the valance which is about 1 1/2 times the window width. If you like more gathers in your curtains, either make 2 valances for each window, or make your valance wider. The print will be the main fabric on my valances. 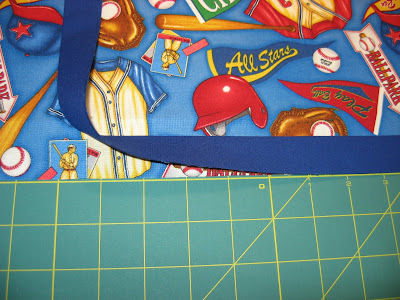 I cut two pieces of the print 8 1/2 inches by width of the fabric (WOF), 8 inches will show and the seam allowances at top and bottom are 1/4 inch each. 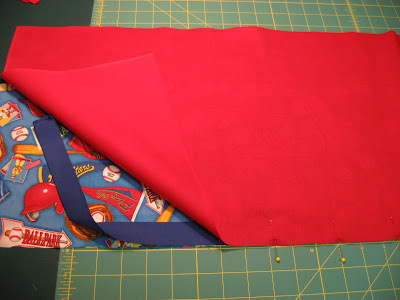 The solid red will be the bottom band of the valance and also the lining all in one piece, so I cut two pieces 12 1/2 inches by WOF, two inches will show on the front, ten inches will show on the back and the seam allowances are 1/4 inch each. The solid blue will be the accent band which is layered between the print and the red and I cut two pieces 2 inches by WOF. 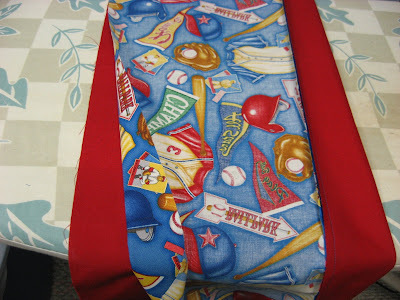 This band does not add any length to the valance since it is layered between the other two fabrics. It can be made wider or narrower to suit your taste. 3/4 inch of this band will show on the front of the valance. 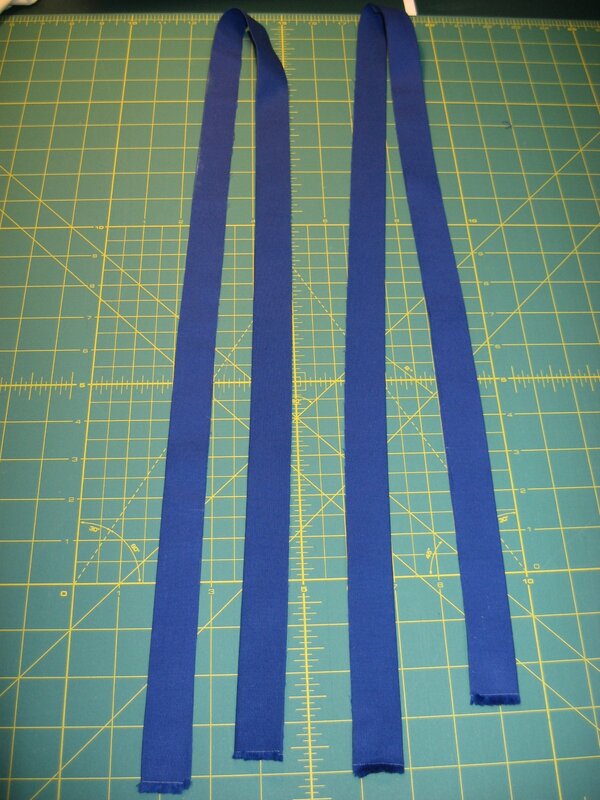 I folded the blue strips in half long ways and pressed them so they are now 1 inch wide by WOF. 1/4 inch of this will be in the seam allowance and the other 3/4 inch will show on the front of the valance. 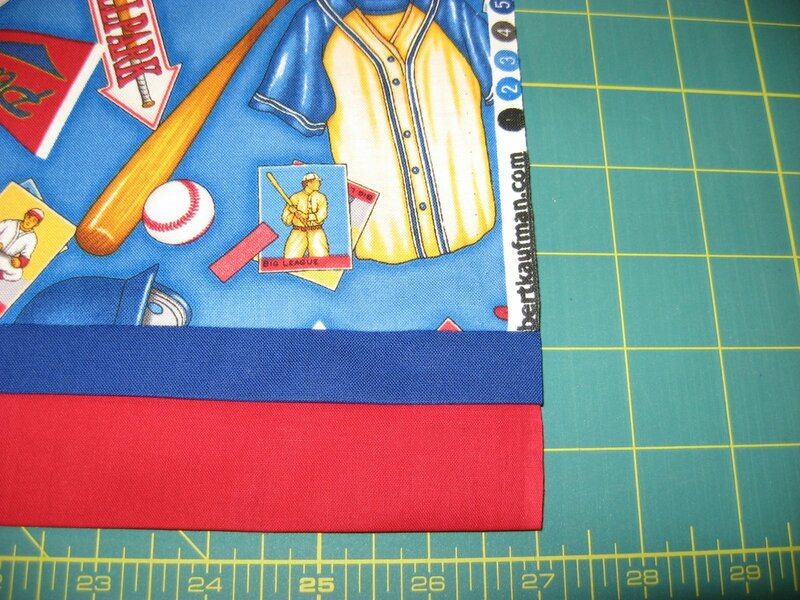 I put the blue band onto the bottom edge of the print fabric with raw edges and selvages even. If your fabrics are a slightly different width from each other, don't worry about that. We'll trim off the extra later. Then I added the red fabric on top of the print and the blue, pinning all layers together with raw edges even. Stitch a 1/4 inch seam through all layers. Open the fabric and press the blue band towards the red fabric and the seam allowance towards the print. Then bring the top of the print fabric up to meet the raw edge of the red fabric with right sides together. 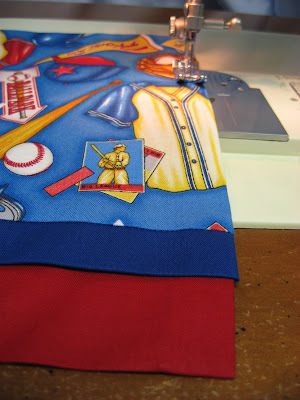 Stitch this seam along the top of the valance. The sides will still be open. 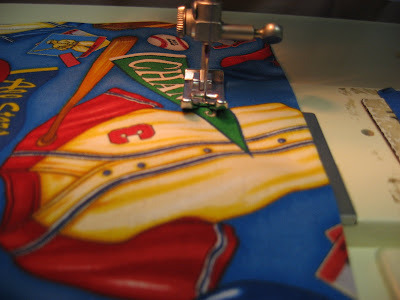 Turn this tube right side out and press the top seam flat so that only the print shows on the front. 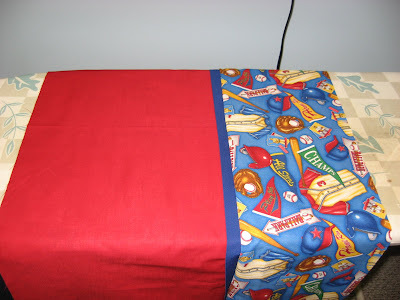 And press the bottom of the valance so that it is flat and the red extends past the blue at the bottom, making sure that the seam allowance is towards the print and the blue band is towards the red. This will make the whole thing stay nice and flat. ...or you can trim off a little to make them even. I trimmed off the blue that extended past the other two fabrics, but I left the selvages on the print and the red. Either way is fine. Turn in the sides about a half inch or so and give it a good pressing. If your selvages match the fabric, you can skip this part and just leave them, but I wanted to turn mine in to hide the printed selvage and also to finish the ends of the blue bands which I had trimmed off. Either way is fine. Now starting from the blue band, stitch up one side of the valance towards the top, stopping at about 1 1/4 inches from the top. This will leave the top of the valance open for the curtain rod. If your curtain rod is bigger, leave a bigger opening. Now turn the valance and stitch across the top of the valance about 1 1/4 inches from the top seam and stopping about 1/4 inch from the other end. Then stitch down the other side of the valance until you reach the end of the blue band and finish off. 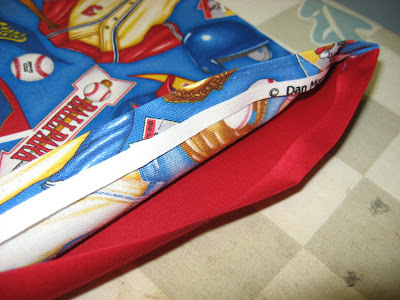 The reason I did not stitch through the red band on the sides is because I was using blue thread and it would not look good on the red fabric, and leaving that little opening at the bottom will not be a problem in the functioning of this curtain. 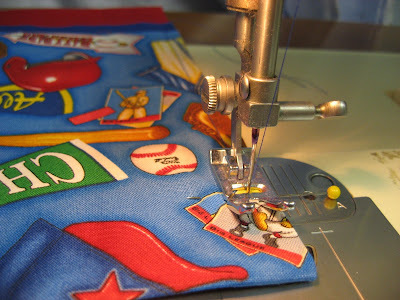 If your thread matches all three of your fabrics, you can go ahead and stitch all the way to the end of each side. Then I brought the curtains upstairs and threaded them onto the tension rods and popped them into the windows. It took me longer to write this tutorial post than it did to actually make the curtains! Give it a try and see just how easy it is to make nice curtains for your own windows! As usual, any feedback on this tutorial would be greatly appreciated. If you have questions or suggestions, please leave a comment and make sure your email address is accessible in your profile or in the comment. 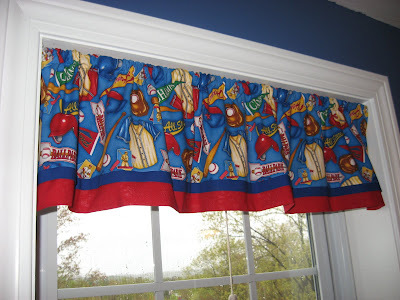 I'd also love to see a picture of any curtains you make from this tutorial. It's fun to share your success with others! In case you are wondering, the school charity banner is complete, ahead of schedule and below budget! Final pictures will be coming very soon! These curtains are so cute and love the idea of using a tension rod - you are so clever. Adorable! And so manly! Many people just don't realize how easy simple curtains are. I did spaceship curtains many, many years ago. After all, the youngest is in grad school now. I forgot to mention - I do cost accounting for a defense contractor. Ahead of schedule and under budget! I love it! Nice work, I like the technique you use. Easier than some I've seen. And quite well explained, I could easily understand not only what you did, but also why. Thanks for all the time you put into the tutorial. 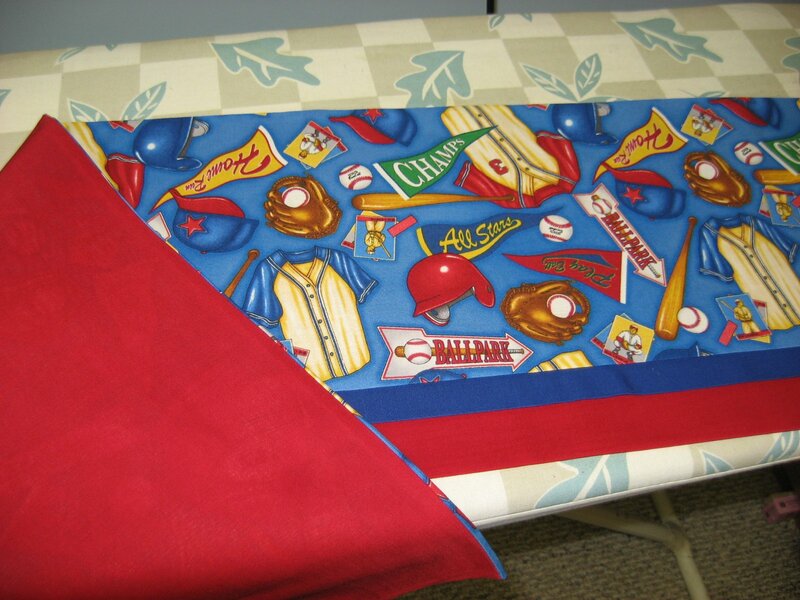 The valance looks wonderful for a little boys room. Lovely !!! These curtains are so cute!!! You are so creative. Thanks for sharing tutorial here. Thank you so much for this tutorial.. I am brand new to sewing, and this tutorial was simple and detailed enough to help me make the PERFECT curtain valance for my bathroom. 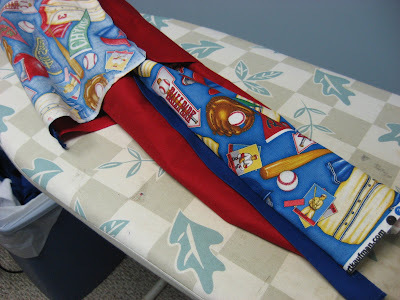 I will use this tutorial for all valances I make in the future. I am so excited!